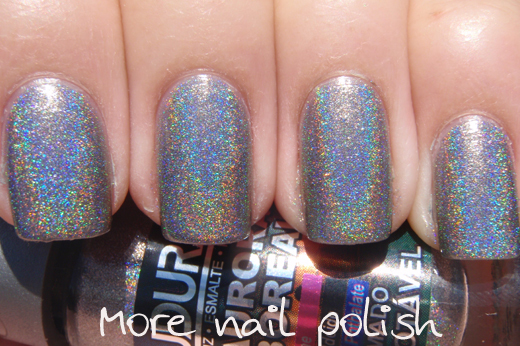 Back to a holographic today from the Ludurana Aurora Boreal collection. This is Notável, which translated to English is 'remarkable'. 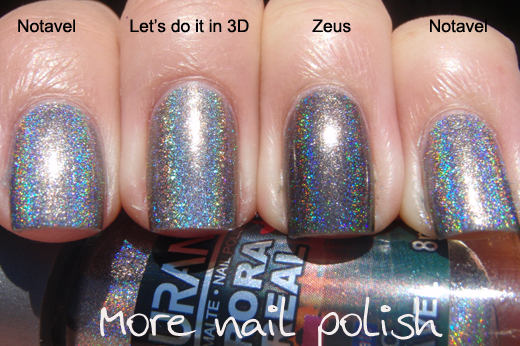 And let me tell you, this polish certainly is remarkable! 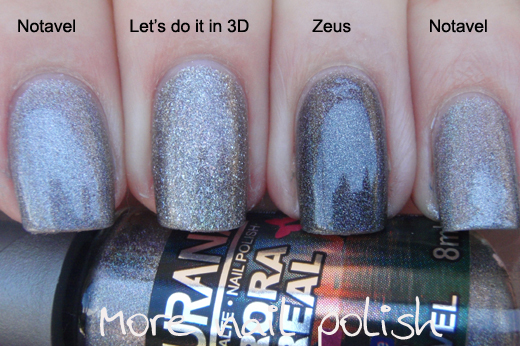 Notável is a light grey holographic polish. It's most definitely not silver, it's a light charcoal. I love this polish so much. 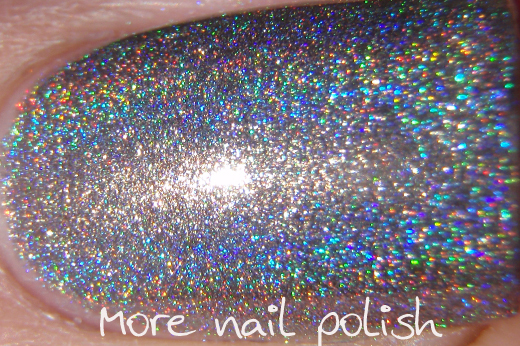 Great holo effect and smooth application. No bubbles for me with this one, like the last two I wore. This was two coats, over Nail Tek II foundation and Seche Vite on top. This polish really reminded me of one of my absolute all time favourite polishes. China Glaze Lets do it in 3D from the Kaleidoscope collection. Here is the comparison swatch. 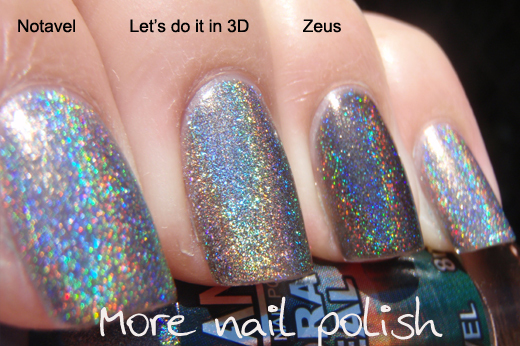 I also put HITS Zeus in there for a comparison, cause it's also a grey holo. 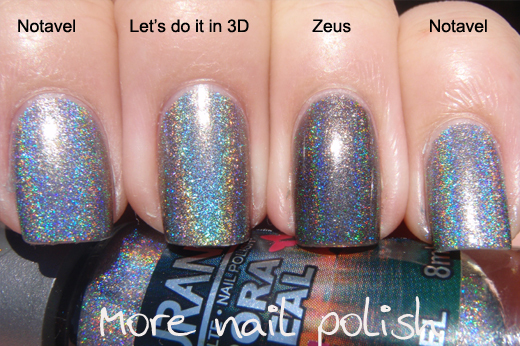 This last shot is in the shade to show the base colours better, without all that holo rainbow getting in the way. This photo shows the particle size a bit better too, where you can see the larger particles in Let's do it in 3D that make it look speckled. 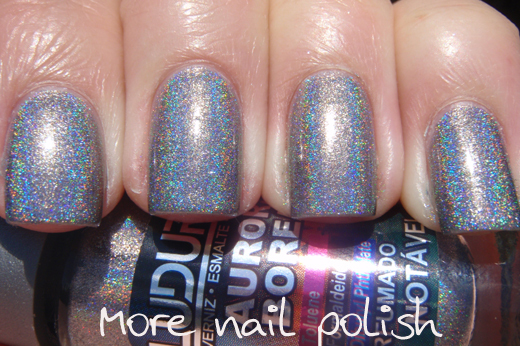 I love that these Ludurana Aurora Boreal holos aren't just a rehash of the more common holo colours. Well some of them are (like the silver one) but it sure is nice to be able to get some unique colours too, especially when you have as many holos as I have managed to collect. Can you post bottle spam of all your holos? It would be nice to see what's out there. alexandrarc - yes, it does lean really blue on me when its in the sun. I love cool tones so maybe that's why I love it so much. Esther - happy to do some holo bottle spam. Love it! Sorry, but that Zeus is by Hits Speciallitá? 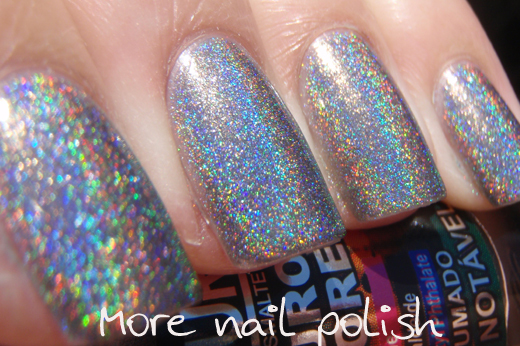 I have that... amazing holo!